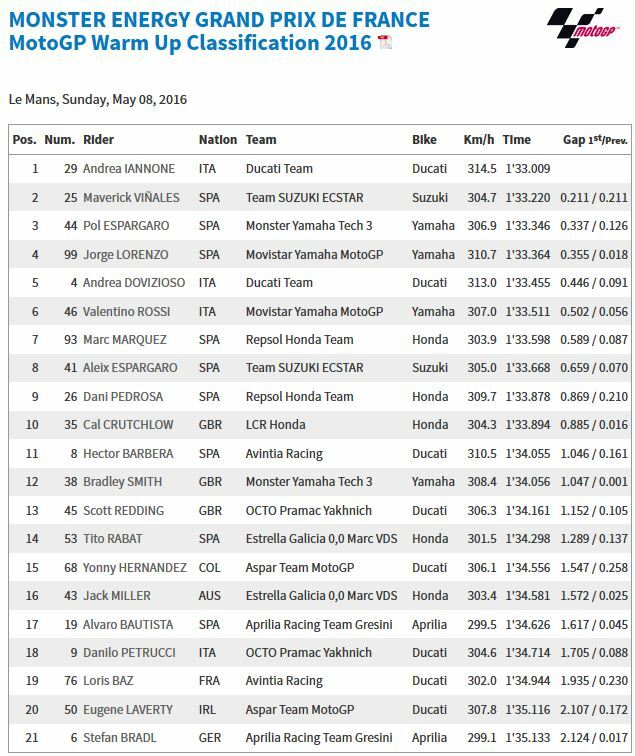 Andrea Iannone set a 1’33.009 to lead MotoGP™ Warm Up from Viñales and Pol Espargaro, the top five within half a second. A strong start to the weekend helps Pol Espargaro secure his best Qualifying since Aragon as he shakes 2015 demons. Each race of the 2016 MotoGP™ World Championship season has seen Pol Espargaro get stronger and stronger as he rebuilds his confidence. His undying devotion and tireless work was rewarded during Qualifying at the Monster Energy Grand Prix de France, his team’s home race. He set a 1’32.502 to take fourth on the grid, only 0.033s off the front row and an entire row ahead of Valentino Rossi (Movistar Yamaha MotoGP), Espargaro will once again start as the leasing Independent Team rider. His last second row start came at the Aragon GP in 2015, having struggled to crack the top six since then in Qualifying. The lap was no fluke as the Monster Yamaha Tech 3 man had been towards the front in almost every session of the weekend. Could a first podium be on the cards? Stefan Bradl and Aprilia Racing Team Gresini teammate Alvaro Bautista both suffered falls during the session. Neither was harmed in their respective crashes. Jorge Lorenzo has been the man to beat in Le Mans, but good a consistent Marc Marquez upset the apple cart? 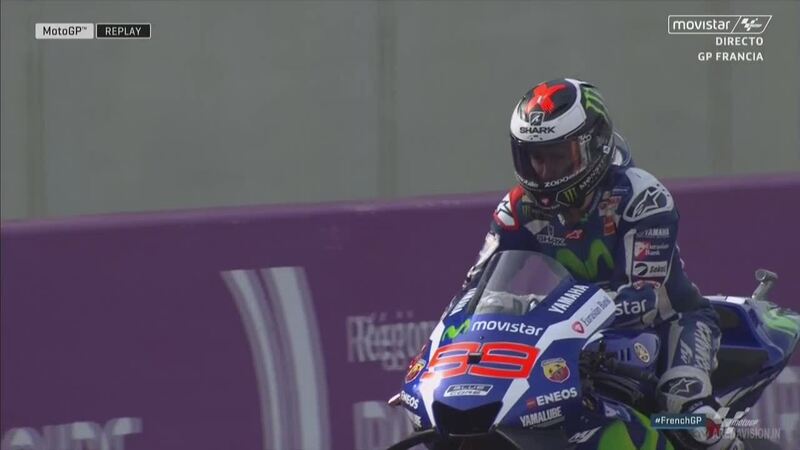 Jorge Lorenzo, the winner at Le Mans last year, starts from pole for the 63rd time in his Grand Prix career – the most poles by any rider in the modern-era of Grand Prix racing. This is the first time that Lorenzo has started from pole at Le Mans in the MotoGP™ class and is the first Yamaha rider to start from pole at Le Mans since Valentino Rossi in 2010. The last seven successive MotoGP™ races have been won by the rider starting from pole position. The Le Mans winner two years ago, Marc Marquez, is in second place on the grid, his 16th successive front row start. 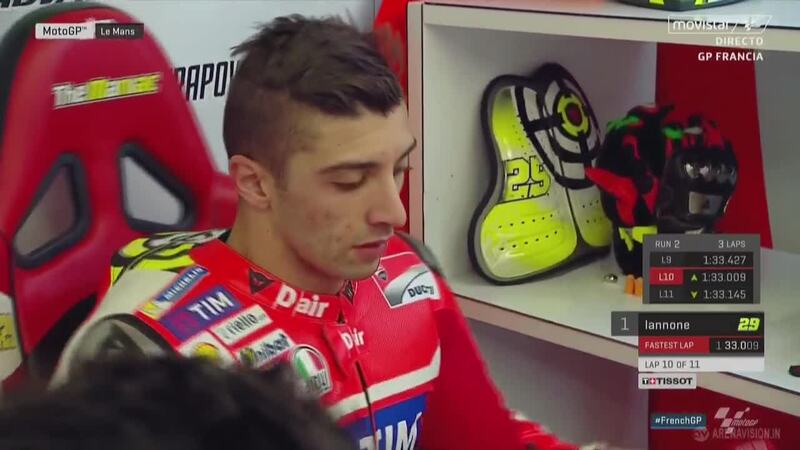 In third place on the grid is Andrea Iannone, his first front row start since the Australian Grand Prix last year. Heading the second row of the grid is Pol Espargaro, his best qualifying result since he was fourth fastest qualifier at Aragon last year. Andrea Dovizioso starts from fifth place on the grid – the first time since 2010 that he has failed to get on the front row at Le Mans. Bradley Smith has taken the final place on the second row, which is his best qualifying result so far in 2016. Valentino Rossi heads the third row of the grid – his worst qualifying result so far in 2016. After his win at Jerez, Rossi will be aiming for back-to-back wins for the first time since he won in Catalunya and at the Dutch TT in 2009. The highest placed Suzuki rider on the grid is Maverick Viñales, in eighth place on the grid, which his is worst qualifying result so far this year. Cal Crutchlow starts from ninth place on the grid and is the second highest Honda rider in qualifying. Heading the fourth row of the grid is Danilo Petrucci, who is returning from injury and starting his first race of 2016.